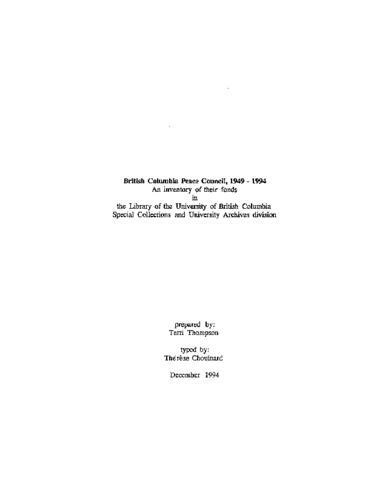 The British Columbia Peace Council, established in 1949, was affiliated with the Canadian Peace Congress and through the Congress had strong ties to the World Peace Council. Its mandate was to support actively the movement for universal peace and security. B.C. Peace Council activities included letter writing campaigns, public awareness rallies, delegations to Victoria and the presentation of briefs to the Legislative Assembly of B.C. Owing to the collapse of the Soviet Union and the end of the Cold War, its activities decreased and the Council was disbanded in 1994. The fonds consists of office files, log books, minutes, posters and buttons. The office files consist mainly of correspondence, including that with the Canadian Peace Congress and the World Peace Council, and printed material. Some of the correspondence include the Pacific National Exhibition. repeated by the organization (e .g . annual meetings (BCPC) and B .C . Peace Council annual meetings; Tibor, East and East Tibor) .